This dish makes a fantastic main course for any celebration. Pork tenderloin is a great alternative to turkey or ham, and is well paired with roasted vegetables and mashed sweet potatoes. In a small bowl, mix together rosemary, sage, garlic, olive oil, apple cider vinegar, salt and pepper. Place pork tenderloin in a plastic ziplock bag and pour marinade over. Seal and refrigerate for at least 4 hours and up to 12. Remove pork and discard marinade. Allow pork to come up to room temperature. Heat a heavy-bottomed skillet over medium heat. Add oil or ghee to pan. When fat is hot, sear pork tenderloin on all sides until brown. Place skillet in oven and roast for 15 minutes or until a thermometer reads 150 degrees F when inserted into the meat. Remove skillet from oven and place pork on a cutting board to rest while you prepare the sauce (the pork will also continue to cook and carry over to the proper doneness). Over medium-high heat, sweat shallots. Add rosemary and sage and sweat briefly until aromatic. Add wine, and deglaze pan by scraping up browned bits with a wooden spoon. Add Dijon mustard, chicken stock and pomegranate juice. Bring to simmer and allow to reduce by two-thirds its original volume. Slice tenderloin and spoon sauce over just before serving. 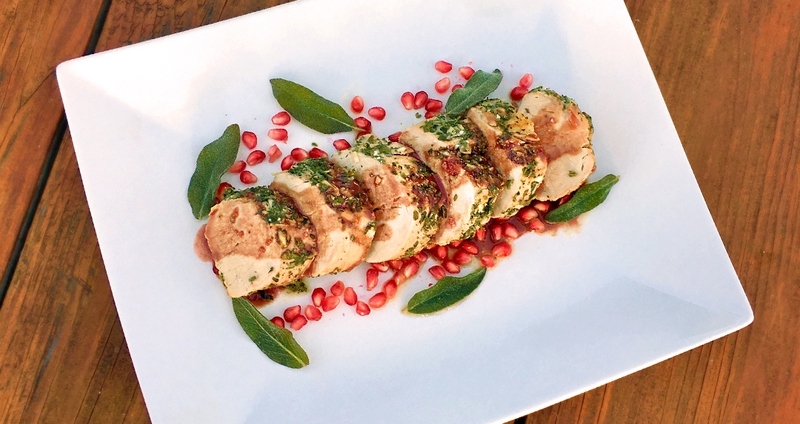 Garnish with sage leaves and pomegranate pips if using. Serve immediately.